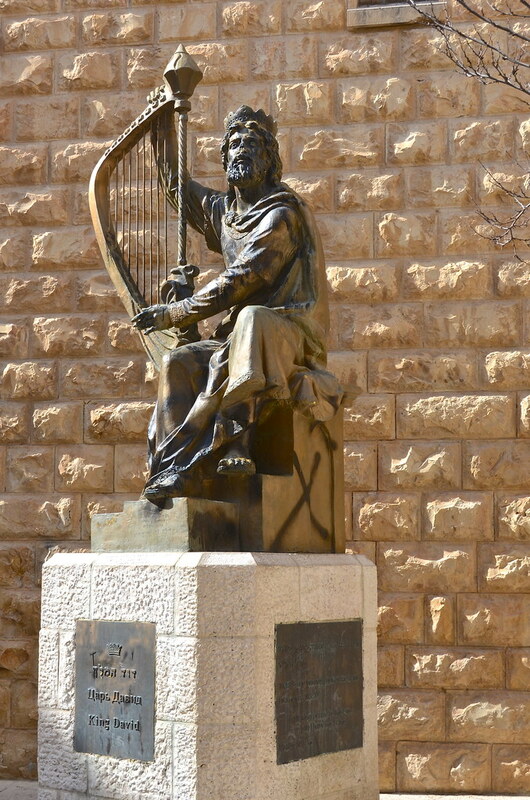 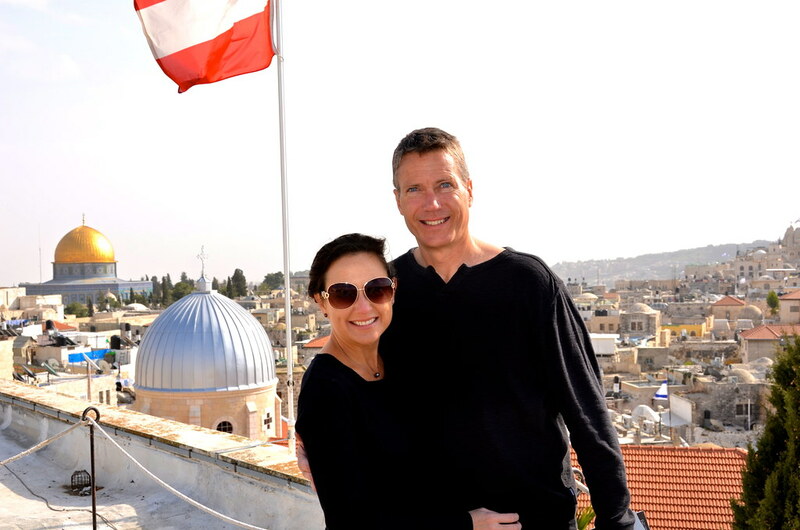 John and I traveled to Jerusalem in January 2013. 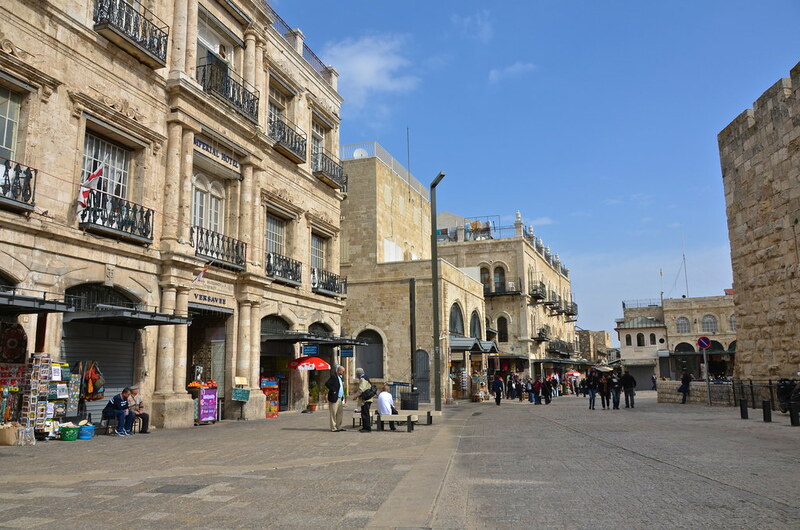 It was a trip that had been on both of our lists for awhile and so we were thrilled when we saw an inexpensive airfare to Tel Aviv. 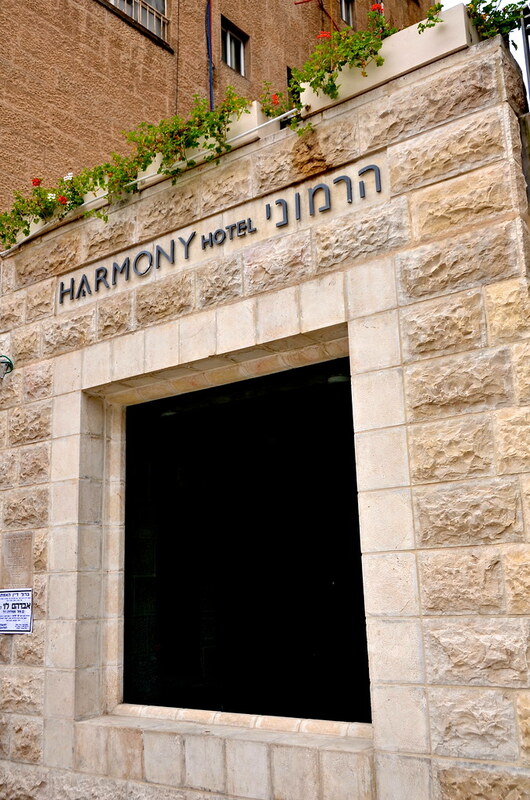 After pouring through all of the reviews on Trip Advisor, we decided to stay at Harmony Hotel. 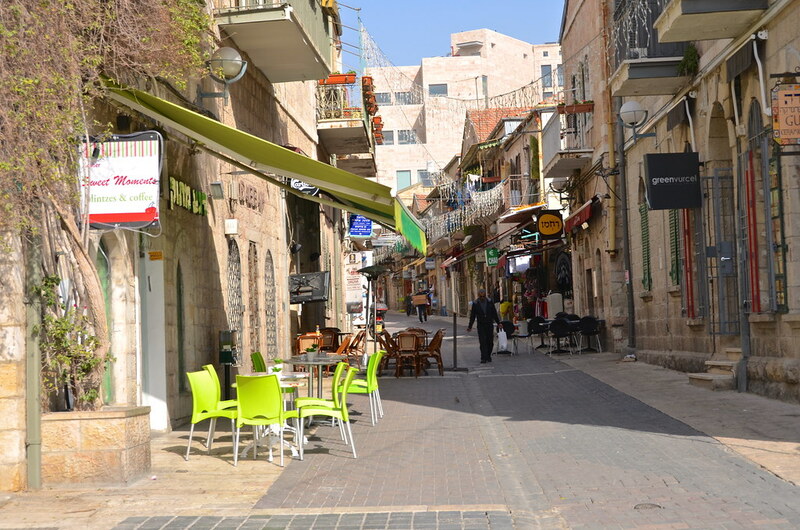 The hotel is located in the Nahalat Shiva neighborhood, a charming area lined with sidewalk cafes. 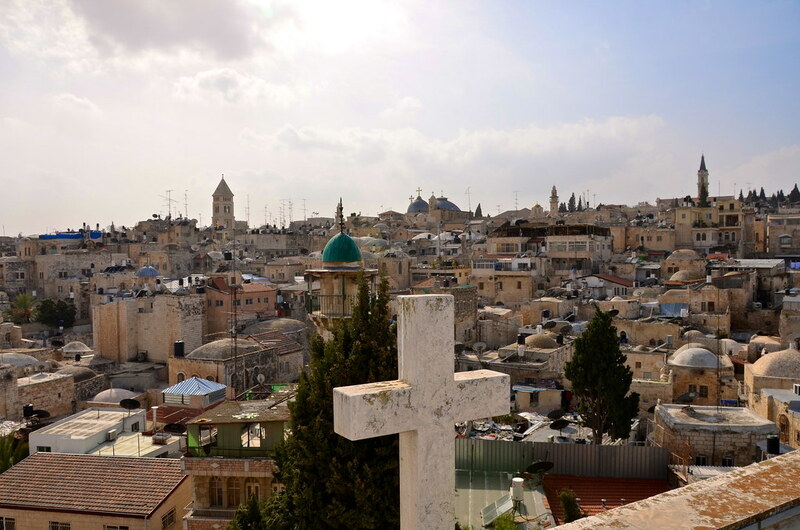 We also chose to stay in that neighborhood because of its short 10 minute walk to the Old City of Jerusalem. 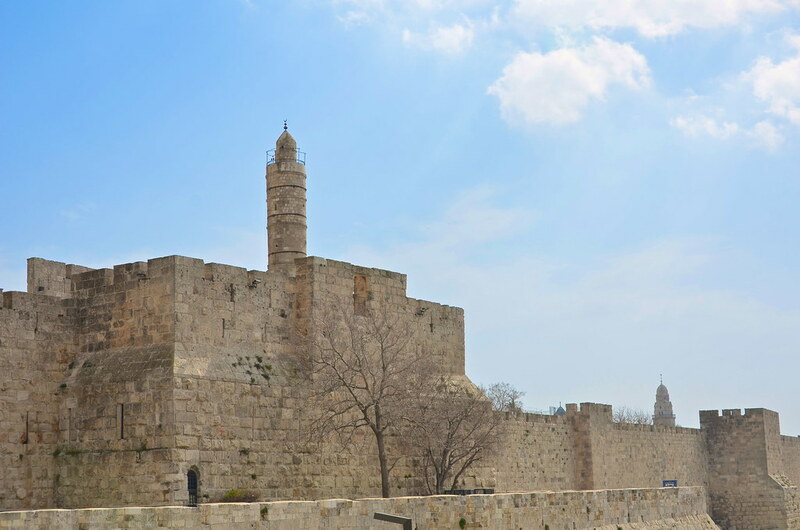 The Old City is a 0.35 square mile walled area within the modern city of Jerusalem. 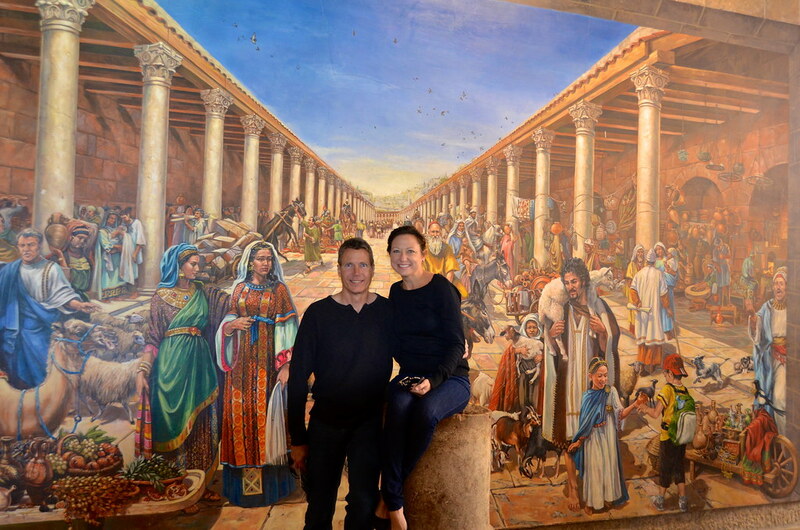 We hired Michele to be our guide for the day. 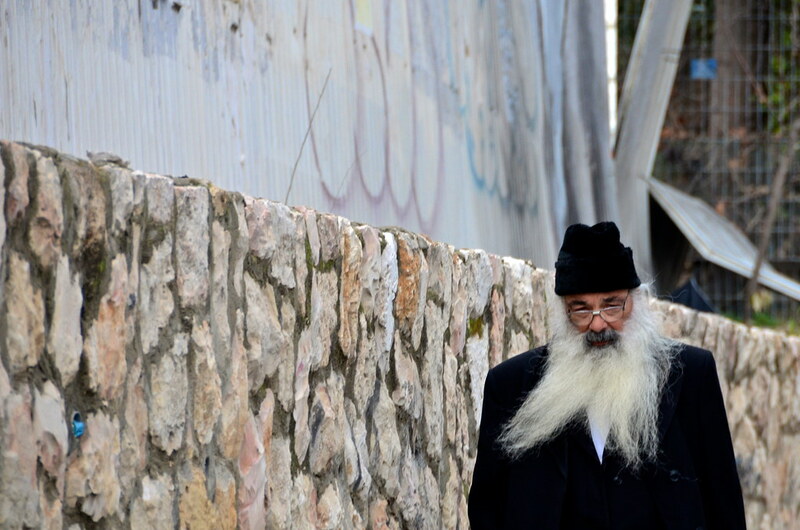 He walked us through the four quarters: Jewish, Muslim, Armenian, Christian. 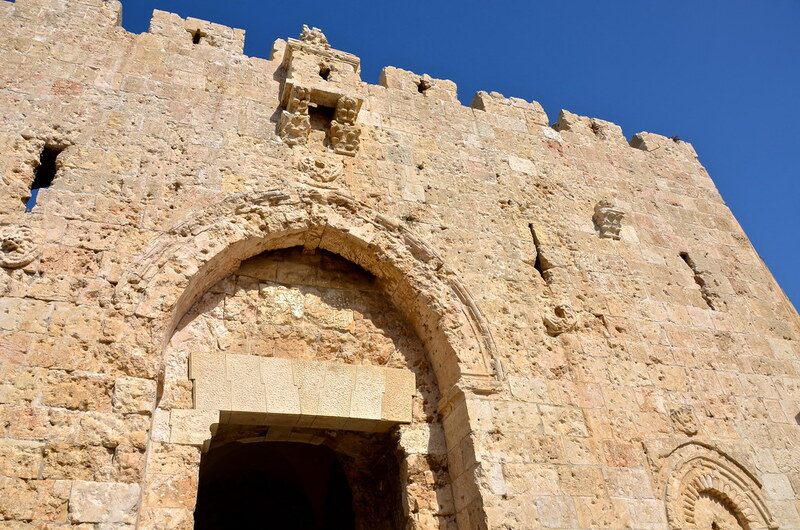 Inside the walls of the Old City you’ll find numerous stories, beliefs, religious traditions, gorgeous architecture, and historic monuments. 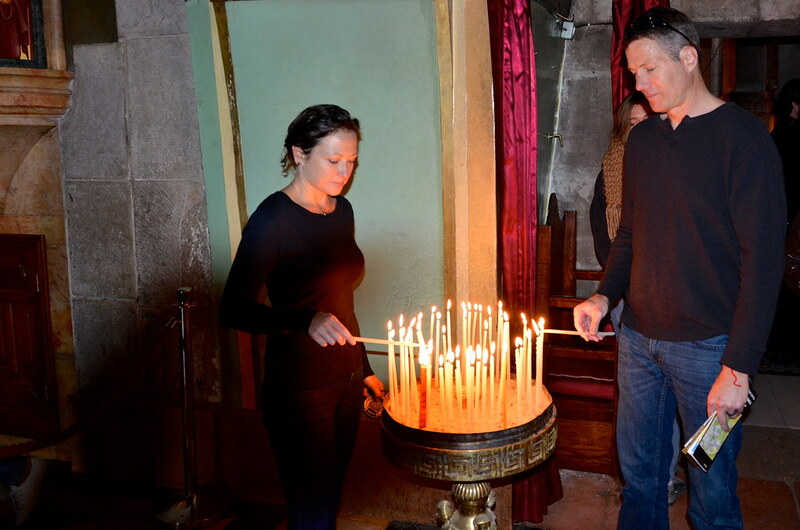 And like we do in every city we visit, we tried to learn and experience as much of it as we could. 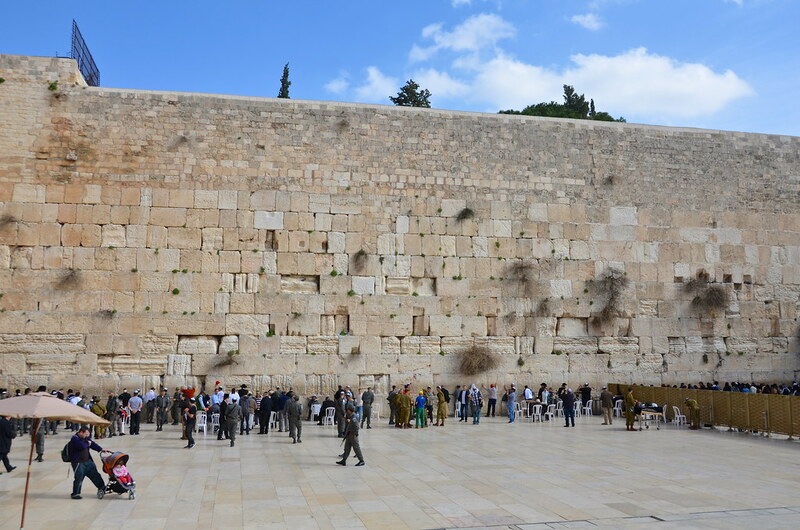 The Western Wall (Wailing Wall or Kotel) is a sacred site recognized by the Jewish faith. 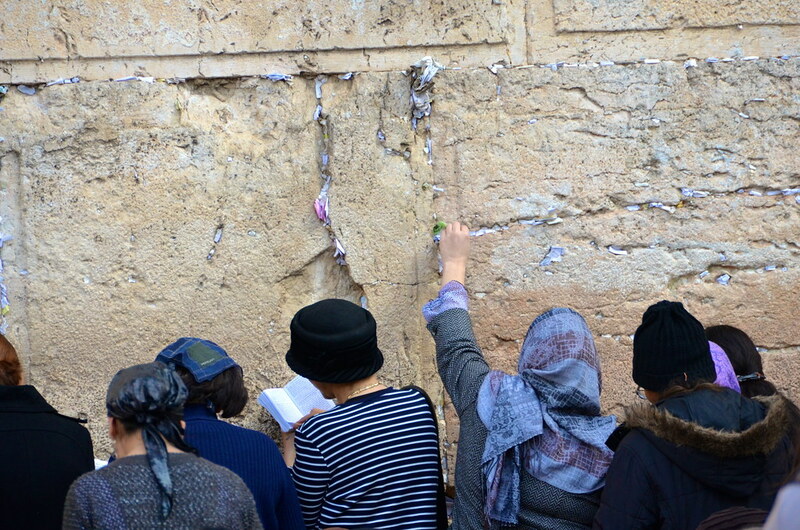 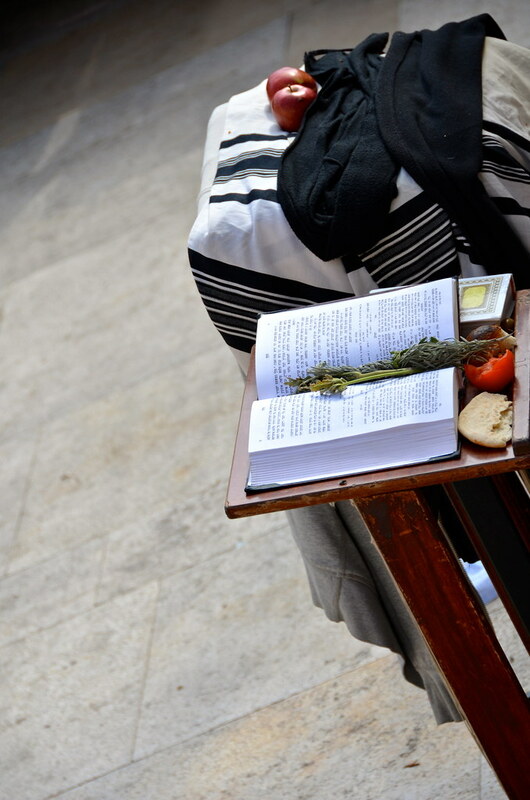 Many people go to The Western Wall to pray, meditate, and place written prayers to God into the cracks and crevices. 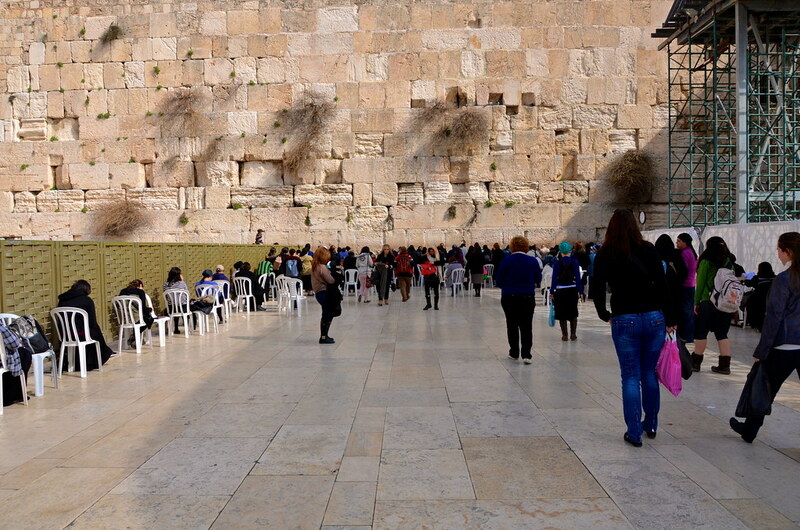 In keeping with Orthodox Jewish tradition, women are not allowed into the men’s section. 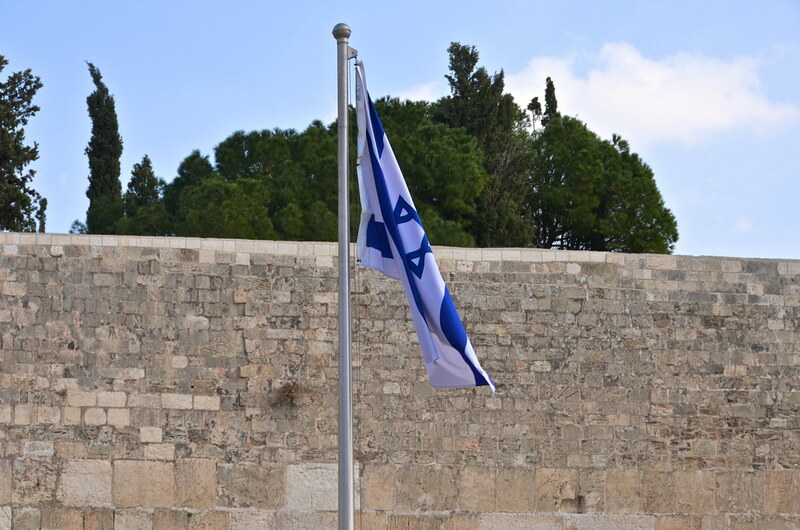 There is a section at the far right for women. 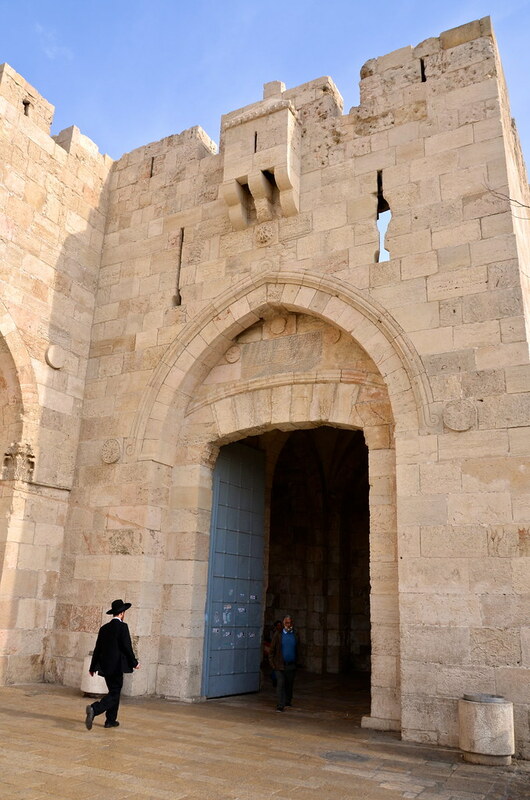 Men must have their heads covered and can borrow a yarmulke at no cost from a box beside the entrance. 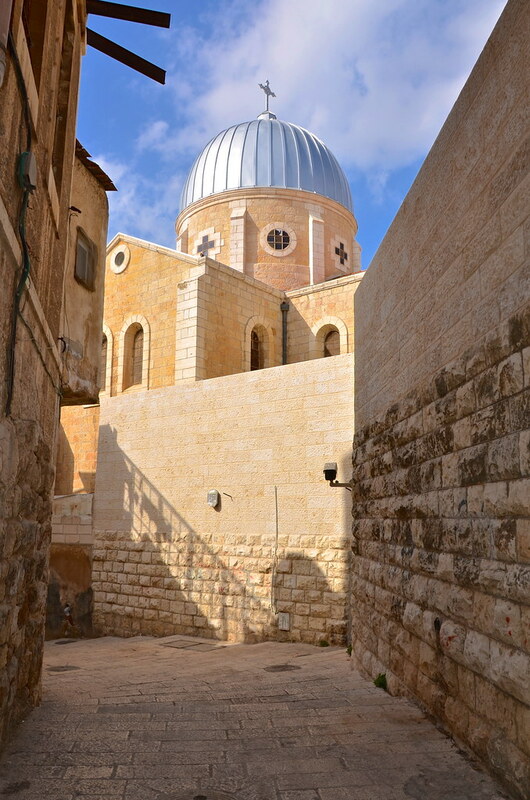 Women must have their knees and shoulders covered. 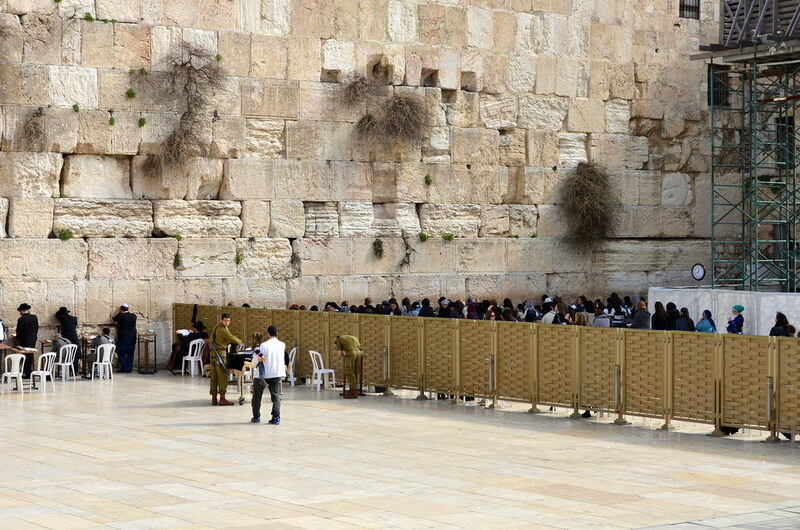 Visitors of all (or no) religious beliefs are welcome to approach the wall to pray or meditate. 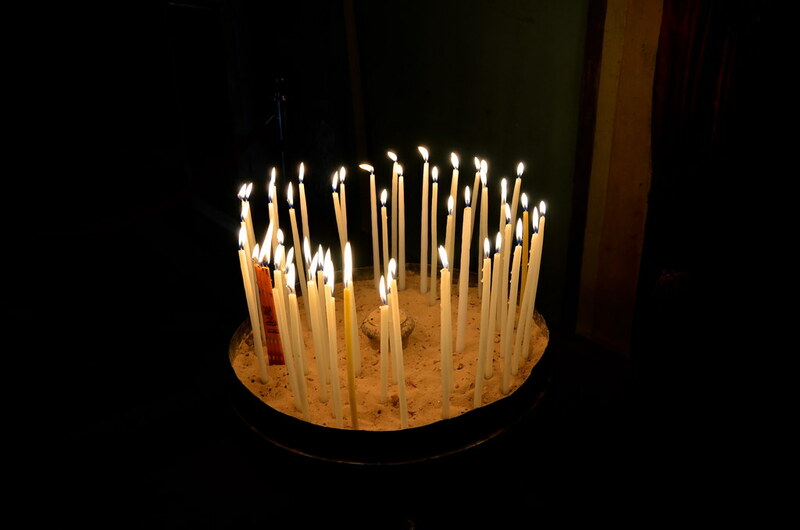 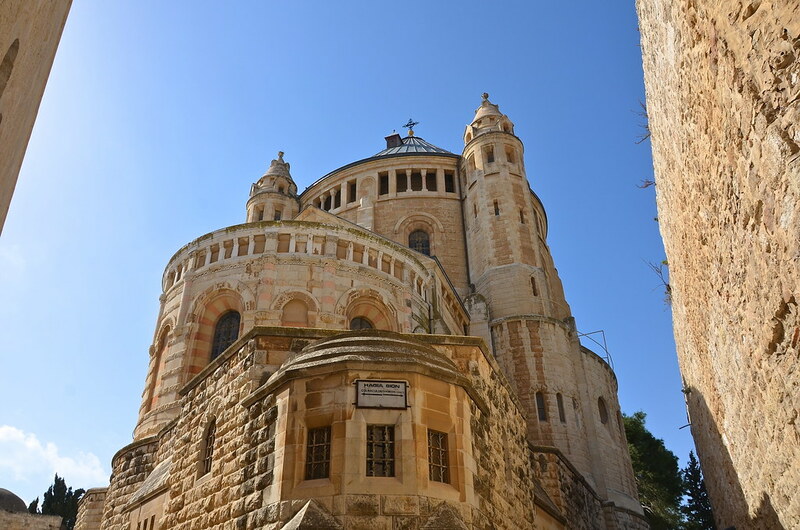 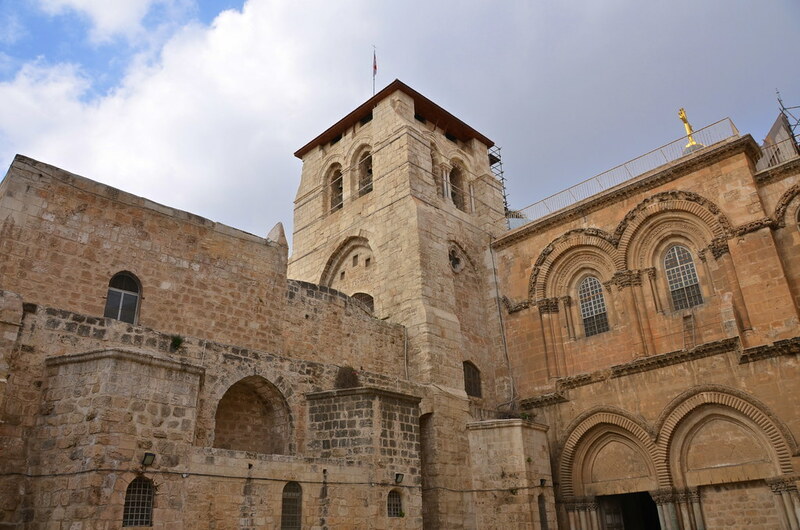 The Church of the Holy Sepulchre is one of the most Holy sites in the Christian world. 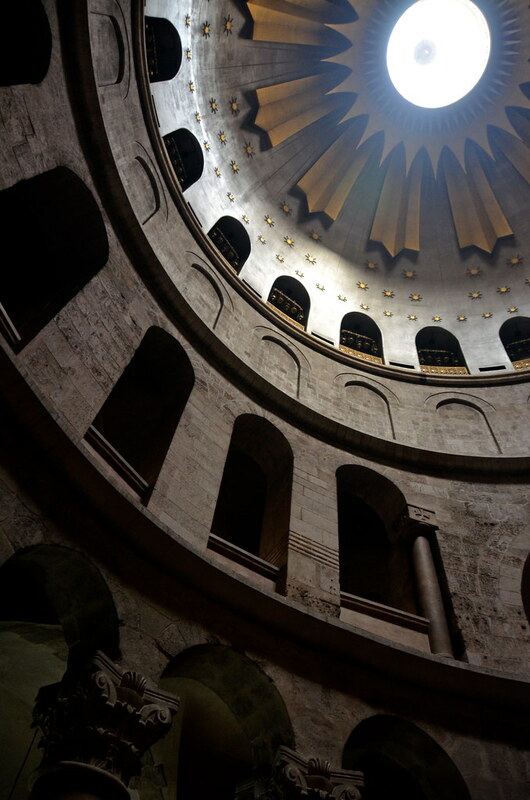 The church is also called the Basilica of the Holy Sepulchre or the Church of the Resurrection. 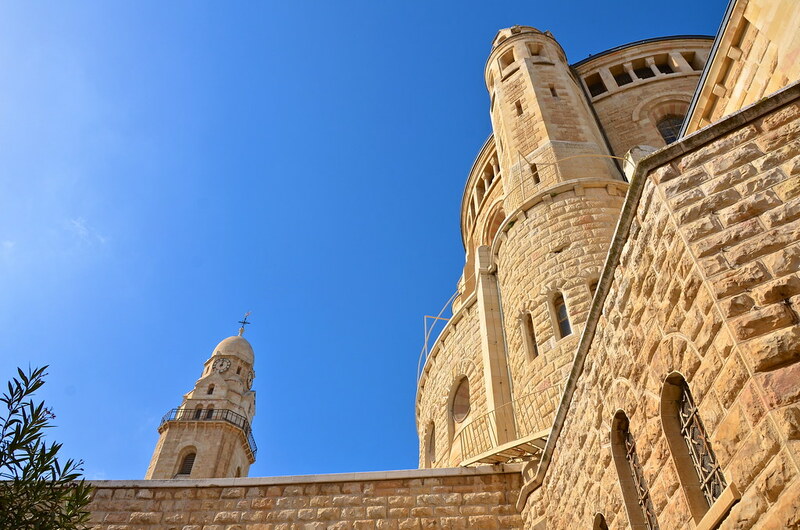 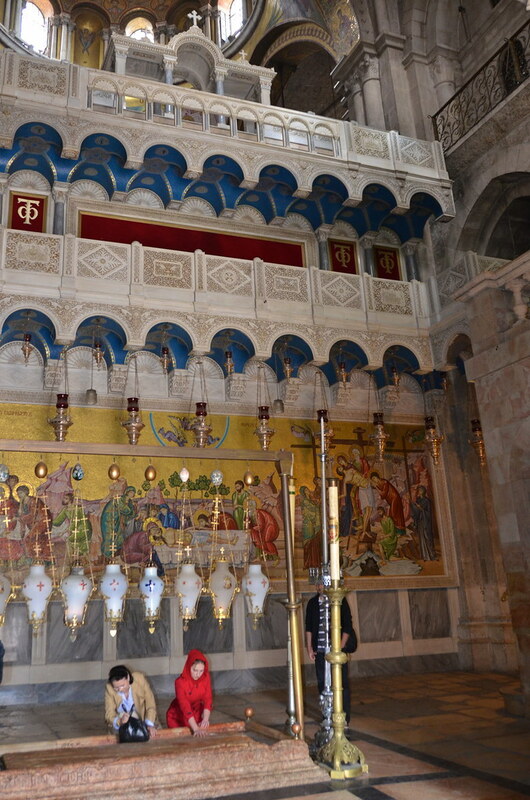 It is believed to be where Jesus was crucified and located over the tomb where he was buried. 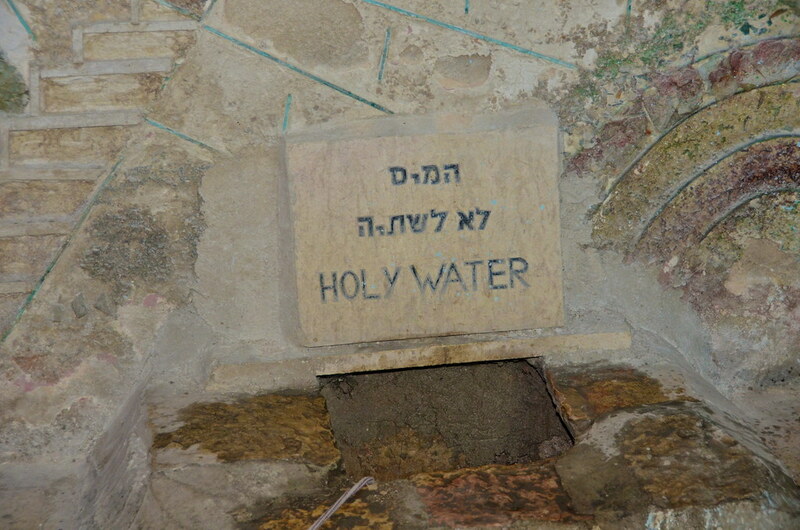 Just inside the entrance is The Stone of Anointing. 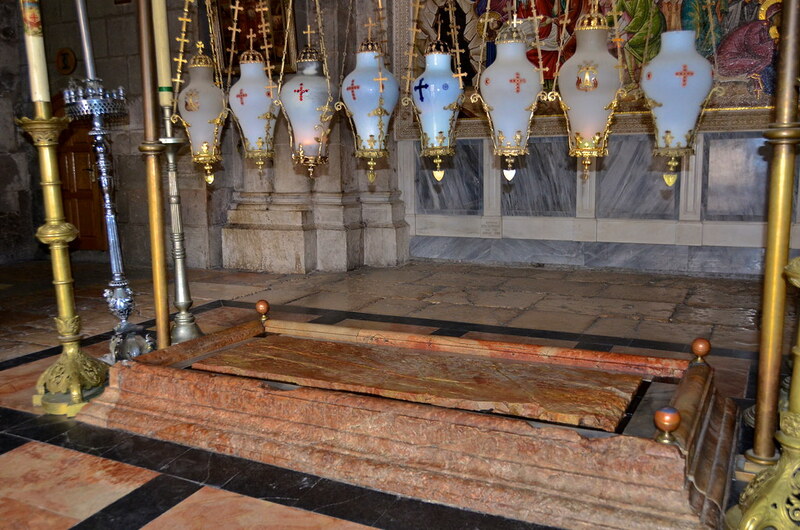 Also known as The Stone of Unction, it is believed to be the spot where Jesus’ body was prepared for burial. 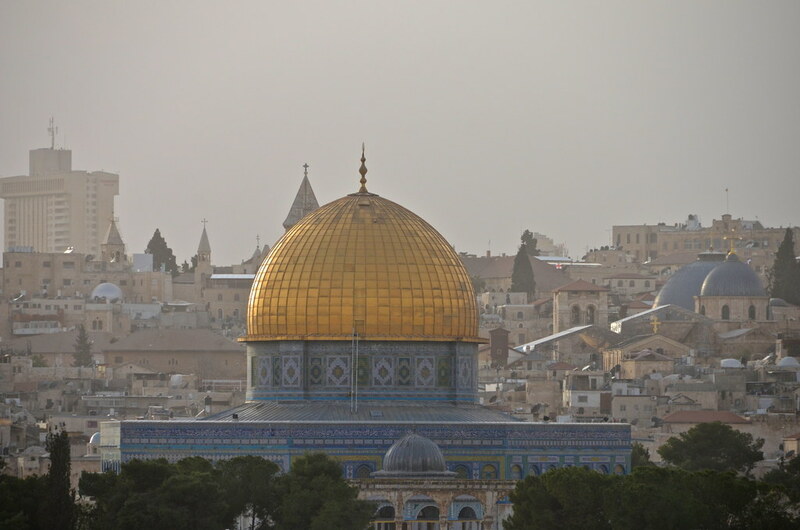 Dome of the Rock is the most famous Islamic site in Jerusalem. 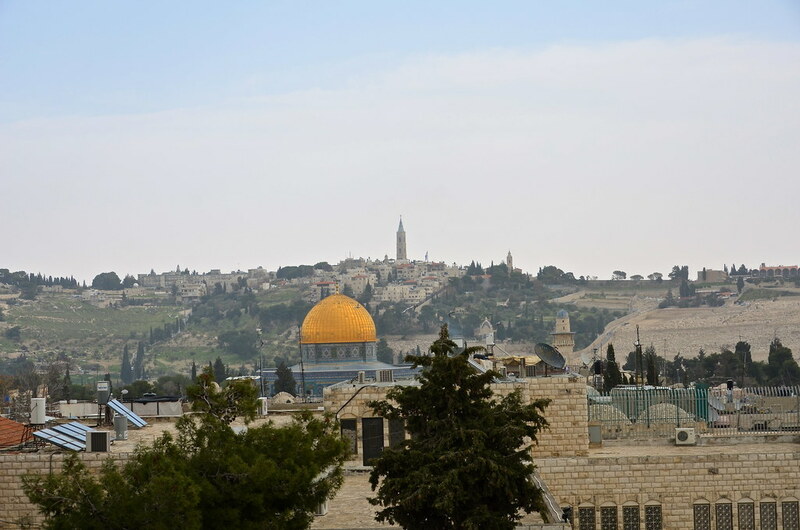 The beautiful Muslim shrine can be seen from all over Jerusalem. 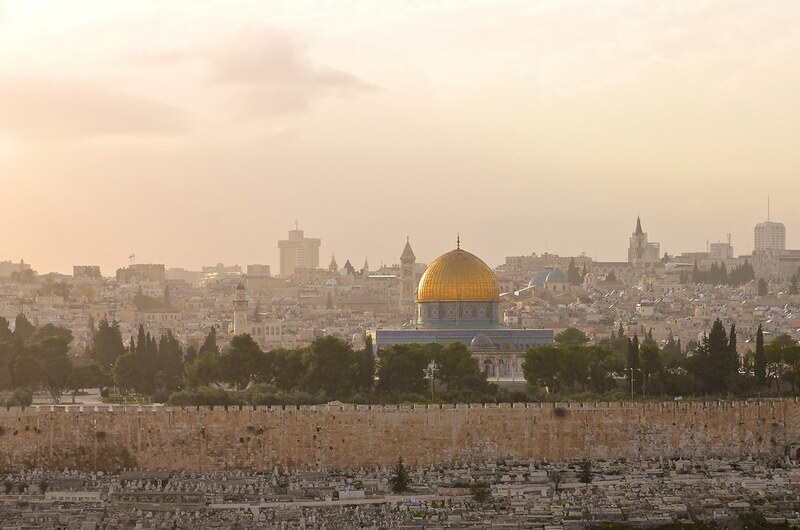 The sacred stone over which the Dome of the Rock is built is believed to be the place from which the Prophet Muhammad ascended into heaven. 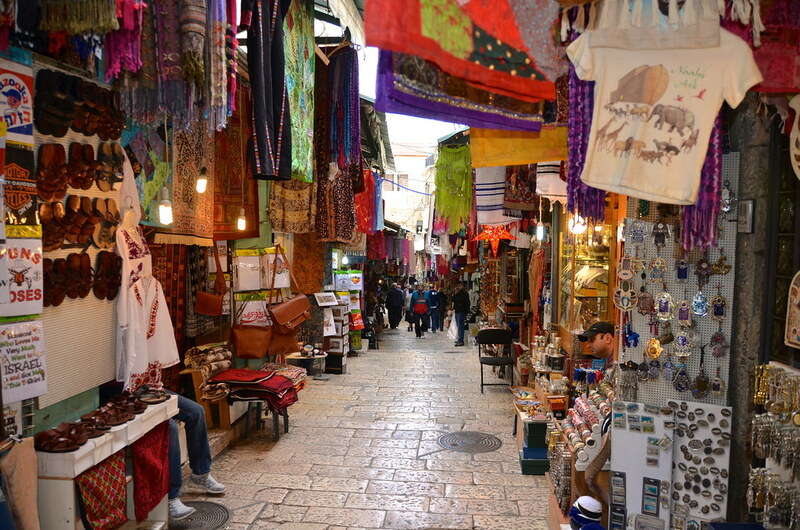 No visit to the Old City of Jerusalem would be complete without a walk through the Arab Souk. 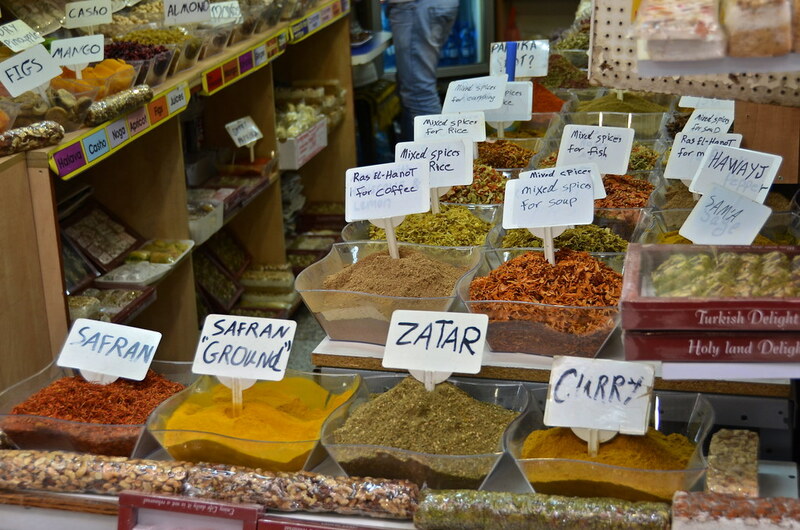 It is a market that stretches through the Christian and Muslim Quarters with merchants selling everything from touristy T-shirts to fragrant spices. 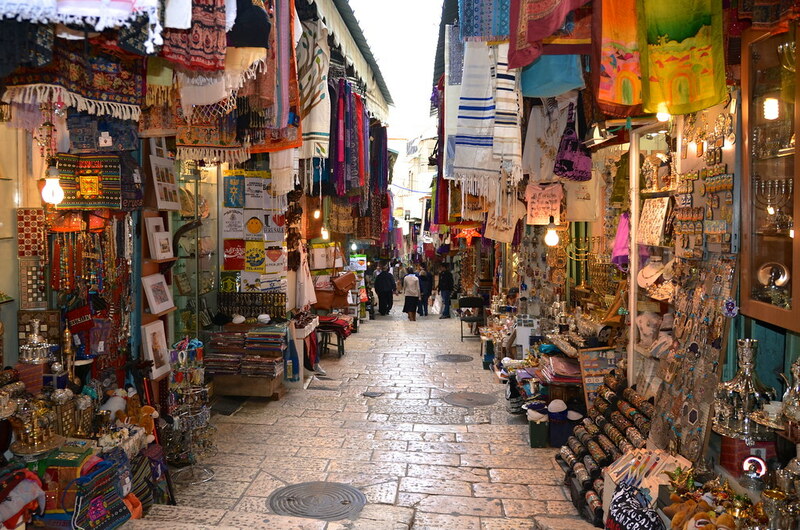 As we walked by the countless souvenir shops, I tried to imagine walking through the narrow cobblestone streets thousands of years ago. 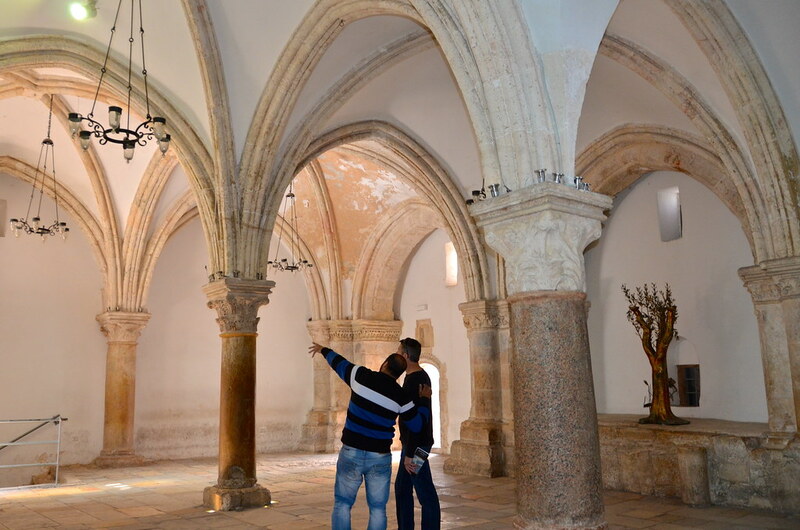 Jerusalem is a city of many faiths and we really enjoyed being surrounded by the people, the history, and the beliefs. 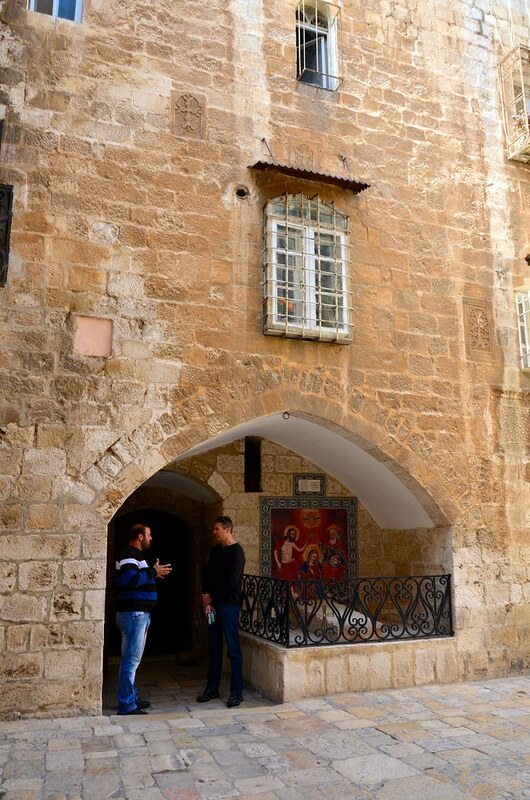 We only got a small taste of the Old City, but we were certainly there long enough to feel the vibe. 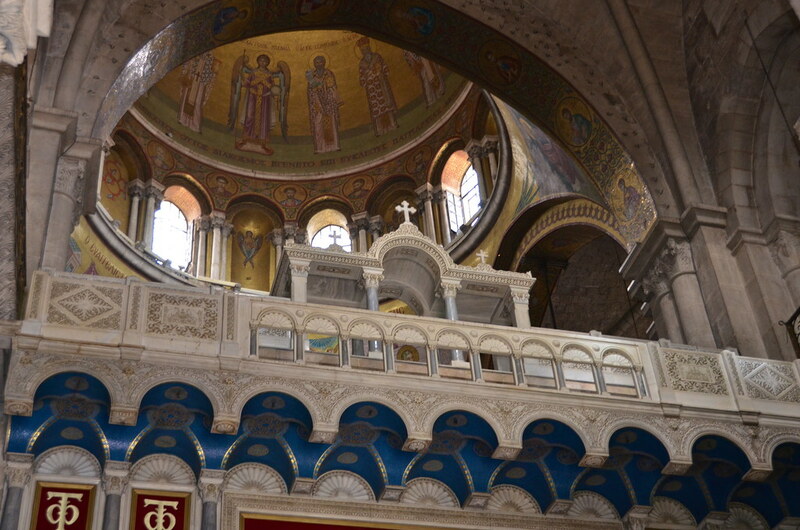 We also visited The Mount of Olives, The Dead Sea, and Masada on this trip. 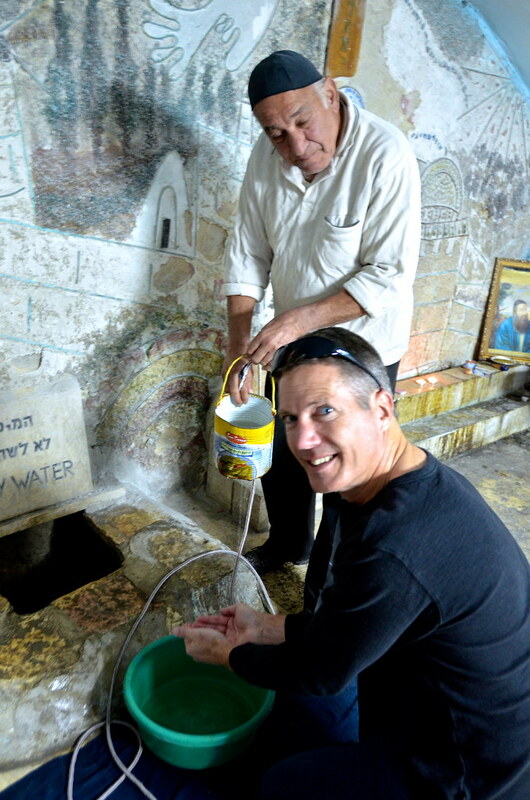 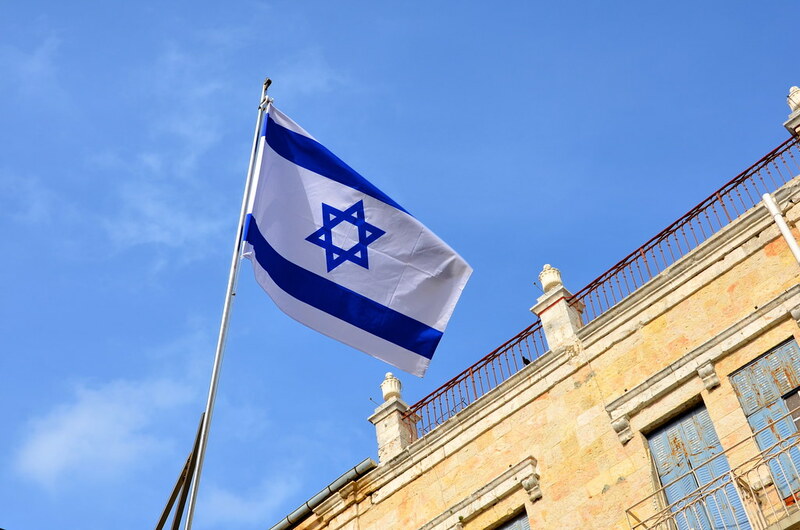 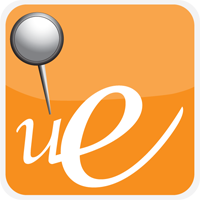 You’ll find everything from our time in Israel HERE. 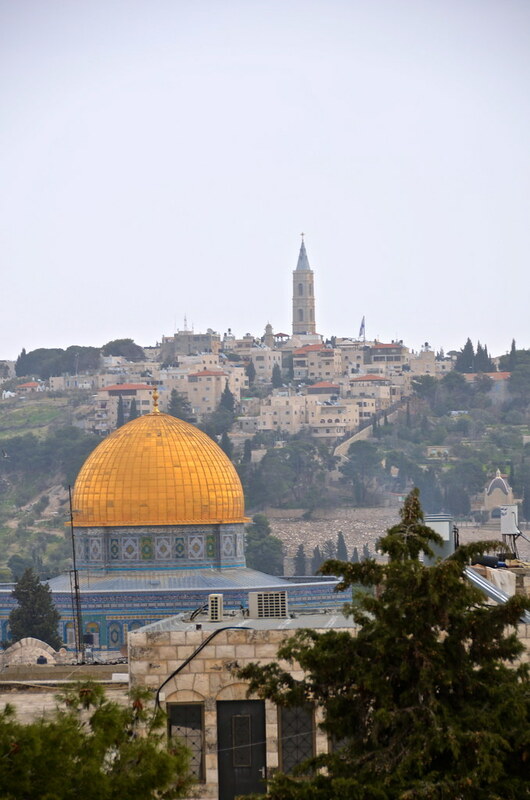 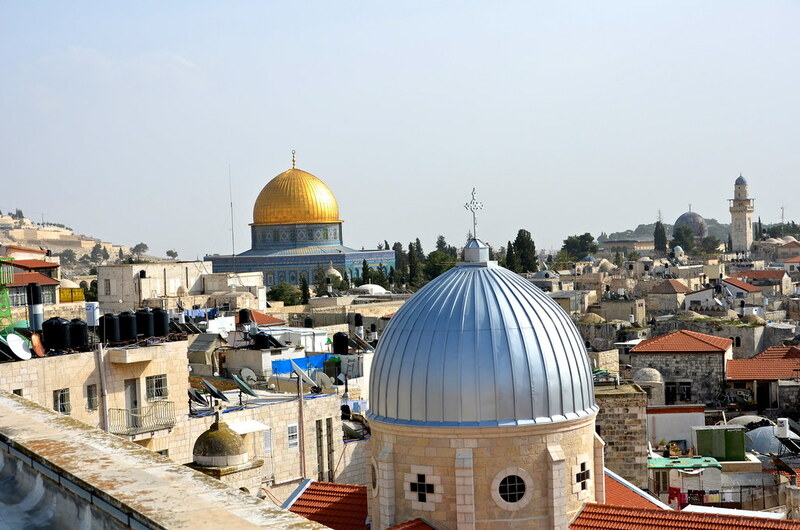 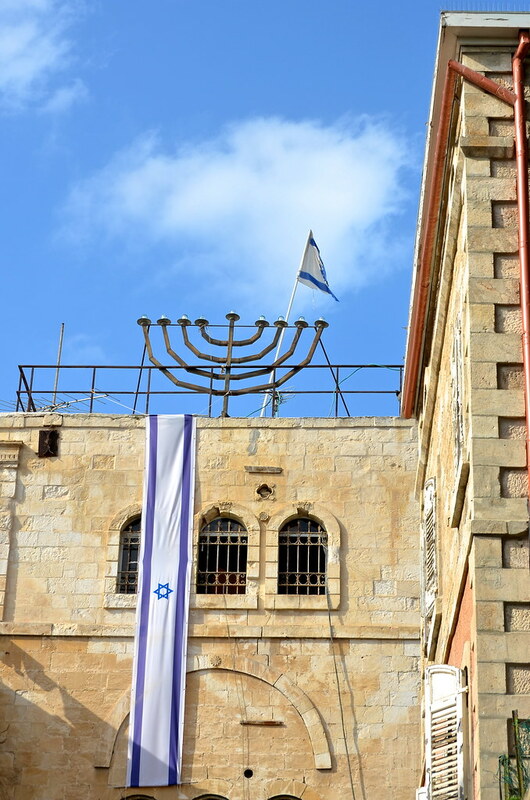 One Response to "Jerusalem – The Old City"